Seriously: if Andrew Scipioni meant to scare the hell out of anyone paying attention, he succeeded. I have seen the NSW police commissioner say some creepy things to the camera in the past – he appears to regard pretty much the entire citizenry as already guilty of some crime or other – his performance in front of the Parliamentary Spooks’ Committee was terrifying. Such is Scipioni’s utter disregard – no, strike that, such is his utter contempt for the rights of the citizen, Scipioni has made a good case for his removal from his post. The sole reason to have a police force is to safeguard the rights of freedoms of the citizen. No free country should tolerate a policeman who resents the very rights he’s supposed to protect. Added: Someone on Twitter just reminded me that Scipioni was in charge of the NSW Special Crime and Internal Affairs unit, at a time when members of that unit were faking evidence to get phone taps against people they didn't like. Nobody on the parliamentary committee thought this taint worth bringing to his attention, heaven knows why. 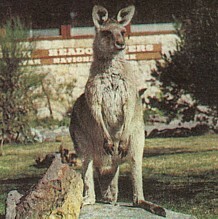 *If you’re not Australian, or too young, you need to understand that Skippy was a television kangaroo which communicated using little “tsk-tsk” noises.